The Renewable Energy Directive (RED) established a framework for promoting renewable energy development in all sectors, including binding national renewable energy targets and a mandatory target of 10% for all Member States for renewable energy use in transport. Commissioned by DG Energy, a consortium composed of CE Delft, Ricardo-AEA, Ecologic Institute, E-Bridge and REKK carried out an assessment of the effectiveness and efficiency so far of measures and actions laid down in the Directive. Stephan Sina, Christine Lucha, Andreas Prahl and Lenat Donat contributed to the study. The resulting study was finished in April 2015, and the findings are published on the DG Energy website. The study is available for download. The evaluation assesses relevance, effectiveness, efficiency and added value of the RED as a whole and of the various provisions laid down in the Directive, in view of achieving the desired outcomes. Based on an evaluation framework, article assessment reports were drafted, resulting in an EU-wide assessment of effectiveness, efficiency and added value of each topical group of RED provisions. Ecologic Institute was responsible for the assessments of Article 3 (targets), Article 6-12 (cooperation mechanisms), and Article 14 (information, certification and training). Furthermore, six country case studies were carried out to gather more detailed information and stakeholder views. Ecologic Institute conducted the case study on Germany. The other case studies covered Bulgaria, Estonia, Poland, Spain and Sweden. The results from both the article assessments and the country case studies were combined into a comprehensive overview of findings that includes regulatory fitness of the RED, best practices and key issues, potential EU level actions and policy options. The study ends with conclusions and recommendations regarding the regulatory fitness of the RED, both for the directive as a whole and for the various (groups of) provisions. The study concludes that a number of provisions (Art. 3, 4, 17-19, 21 (b), 22-23) are found to be both effective and efficient, whereas the effectiveness and efficiency of the remaining provisions cannot yet be thoroughly assessed, due to either lack of data, delays in MS implementation or limited use of the provisions so far. Overall, the administrative burden related to the RED seems reasonable. The RED is seen by most stakeholders as a key contributor to EU-wide renewable energy deployment. Meeting the mandatory transport target effectively and efficiently is hampered inter alia by the delay in the ILUC decision making process. The study recommends that, although all articles of the RED have the potential for further improvements, the current provisions should not be modified in order to contribute to stable policies that are key to investor security and therefore to the effective and efficient achievement of the 2020 targets and objectives. As an exception to the rule, the indirect land use change (ILUC) proposal related to Art. 19.6 should be decided on as quickly as possible in order to facilitate meeting the 10% transport target effectively and efficiently. Furthermore, the study recommends to decide on the longer term framework for RES regulation in the EU well before 2020, to provide clarity on market outlook and continuation of the current RED provisions beyond 2020. This would ensure a seamless and efficient transition from the 2020 to the 2030 policy package, which will strengthen the current regulation and measures and encourage investments in RES throughout the EU. 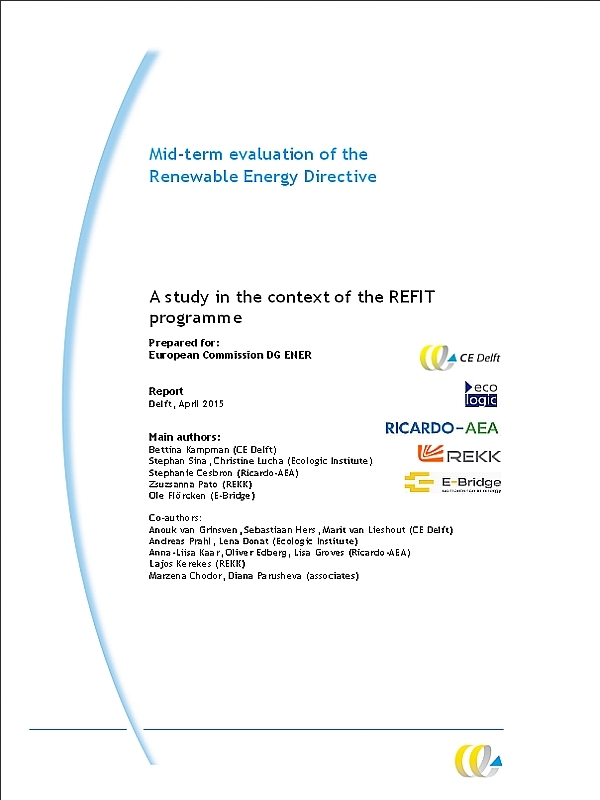 CE Delft, Ecologic Institute, Ricardo-AEA, REKK, E-Bridge: Mid-term evaluation of the Renewable Energy Directive. A study in the context of the REFIT programme. Delft, CE Delft, April 2015. 4.4 Key issues: could they be resolved by EU-intervention? Renewable Energy, Ecologic Legal, Evaluation, REFIT, Directive, Electricity, Heating and Cooling, Transport, Biomass, Biofuels, Sustainability, Cooperation mechanisms, Europe, Bulgaria, Estonia, Germany, Poland, Spain, Sweden, Evaluation according to relevance, effectiveness, efficiency, added value. Article assessment reports and country case studies including interviews with stakeholders, resulting in comprehensive overview, conclusions and recommendations.